There’s something about the frothy, sweat-glazed fur, the players’ riding pants dusted with sand, the crack of the mallet as it contacts plastic for a 100-mile-an-hour volley, the spirited neigh and snort, that is, well, both primitive and elegant. It is almost as if the 6000-year history of man’s relationship with the horse reaches an interactive pinnacle in Polo: man and beast think, and act, as one. Not only can the horses pivot 90-degrees in a split second to enable a score, they’re also known to kick the ball in the right direction. That takes breeding. At the Pre-Match Polo Pony Auction, I found myself amid a crowd of cowboy hats and worn boots, faces that spend more time out-of-doors than in. Real Polo Pony people know the genealogy of a horse just from the size of its withers. With one considered look, they decide whether the pony would be better cutting cattle from the herd on the plains or executing a 180-turn on the 15-yard line. I hid behind my Polo America brochure and tried to blend in while the horses were brought into the arena and the nasal twang of the auctioneer accelerated into a lilting realm where only folks with giant belt buckles could follow. Between the auction and the matches, the Polo Village Expo opened its stalls—horse feed on one side of the aisle, the Lamborghinis on the other. Originally a game played among cavalry in Persian courts, Polo started out snooty. It traveled among royalty throughout the Middle East before reaching the sub-continent where the Maharajas upped the glamour, attracting the status-conscious Brits, who brought the game to Europe and eventually to the Americas, where Polo has had an uneasy relationship with rodeo. Although the Black Tie Blue Jeans Awards Dinner did its best to bridge the cultural divide, buy-in costs are steep when viewed from the desert floor. Each Polo player needs three or more horses, since the mounts are changed between, or even during, a “chukker” (a seven-minute quarter). A thoroughbred pony can cost upwards of $35,000, before the grooms, stables and transportation are factored in. No wonder organizers offered a “Polo Sponsorship” seminar, along with workshops on “horse hauling” and “equine herpes.” Caring for the horses is big business: a top team comes with an annual million-dollar tab. Every Polo Pony gets a full-body massage every day. The horses earn their lavish lifestyle through performance. Bursts of speed alternate with tight scuffles as players try to find—and eventually maneuver—the ball out from beneath the herd of beasts and scud it toward the goal. Whoever thinks Polo is boring has clearly never seen a pony plunge toward the wall, turn just before crashing, somehow back-up within a writhing knot of fur and leather, then rocket cleanly out of the pack for a goal. The horses have to be comfortable with winding wooden mallets, hurtling projectiles, body-blocks by other horses, and, above all, with their riders. Up to 75% of a player’s skill is in the mount. The horse is more sensitive to cues than an expert lover. 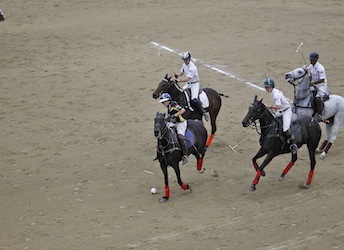 During the Las Vegas Polo Double-Header, I was literally on the edge of my chair, unable to hold on to my champagne. Seated in the front row, I leaned forward over the rail when the horses surged to the other end of the arena, recoiling when the pack scuffled as if against my knees. Horsey concentration and excitement were evident in those shiny, soup-spoon eyes, ears erect and exquisitely twitching, as the ponies sought imperceptible cues from their riders—a step forward, two steps sideways, gallop left, stop on a dime, snort. The Bally Switzerland team won over Lamborghini Las Vegas in the first boys-against-girls match, while 10-goal players (the rough equivalent of a scratch handicap in golf), sponsored by Hoffman International Properties and Hybrid Air, competed in the second game, with Hoffman coming out on top. If I had had my way though, I’d have given the trophies to the horses. This entry was posted in Sports and tagged arena, auction, auctioneer, Bally Switzerland, casino, cattle, cavalry, champagne, cowboy, cultural divide, game, glamour, grooms, horse, Lamborghini, Maharajas, mallets, massage, match, Pausanias, Persian couts, player, polo, pony, riders, rodeo, sports, stables, Strip, trophy, Vegas, withers. Bookmark the permalink. Was Prince Harry in attendance? Or, is he still such a fresh newcomer to our West, he isn’t making the polo rounds, but is focusing on his rented Harley? No Prince Harry, alas. But a number of ladies in lovely dresses.